Recently, I've been out and about meeting lots of fab local businesses, spreading the word about reflexology. I've loved finding out more about the people behind the names, and so if you're interested in my story, here's a bit about me. 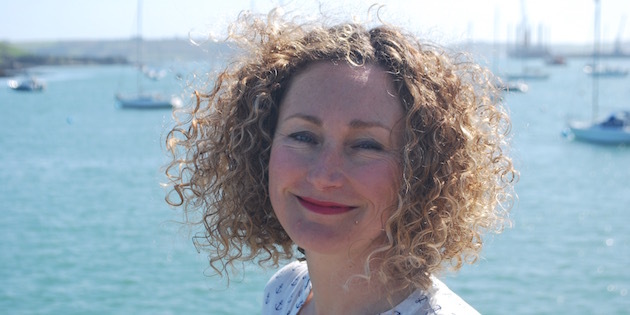 I’m Melanie Allcott and Rebalance Organic Reflexology is my reflexology business in fantastic Falmouth on the south coast of Cornwall. I’ve lived here with my family (husband, daughter and son) for 18 months. My husband is a self-employed graphic designer and my kids are in the last couple of years of primary school, although it already feels like the teenage years are upon us! As a family we've also lived in Stroud (idyllic Cotswolds life, especially when the kids were little) and Brighton (so much fun and where the babies were born). In my single life I lived and worked in London, Essex and Oz. I’m originally from Southampton which I left when I was 19 (I knew I'd never settle there but I have some fond memories). For me, Falmouth has all the best bits of all the places I’ve lived in before (coast, countryside, vibrant atmosphere, foodie haunts, festivals, fun and friendly people) and we won’t be moving our kids' schools again so, all things being well, I’ll be here for some time! I spent nearly 20 years in the employee assistance/trauma support/stress management industry before retraining as a reflexologist in 2015. The end result of the work I did was really rewarding but life in the corporate world was losing it’s shine and I needed something more. I discovered reflexology after having a 15 minute taster session with absolutely zero expectations. I can’t accurately describe how different that short session made me feel, only that I felt like I was buzzing full of positive energy. A few more treatments later I was hooked, I signed up to train as a reflexologist (hard work but sooo worth it) and quit my job halfway through the course (financially unwise but for my soul, the best thing I could've done!). I can honestly say that becoming a reflexologist and running my own organic reflexology practice has been the best decision I’ve ever made. Yes it’s challenging, and I often find the whole work/family/life balance thing a juggle, but I properly love what I do! I love what reflexology offers my clients whether it’s support with a health condition, stress relief or a bit of pampering. And I just have the best clients! They range from two weeks to 84 years of age and come with such interesting backgrounds and life experiences. I enjoy all the extra learning and training I undertake, for my own personal development and to maintain my membership of the AOR. And I love meeting other therapists and small business owners in the local area, such a supportive bunch! In addition to my reflexology, I have a business degree and a CIM marketing qualification. I’m a qualified stress management trainer and just recently I’ve trained in maternity reflexology. I passed my driving test first time round at 17 but shortly afterwards wrote off my first (and favourite) car, a yellow Fiesta called Julian Canary. I’m now the sensible older sister. Although I wasn’t always so sensible, I just got caught less. Sorry sis! My curly hair seems to get more untameable the older I get. I don’t mind getting in the sea all year round, as long as the sun is shining. I love bodyboarding and swimming but I still can’t master surfing. Not giving up though! I did a lot of travelling before having children and although we have lots of adventures in our campervan, I want to start taking them on some far flung adventures soon. We've recently undertaken a major house renovation project which was the most stressful thing I've/we've ever done. Why don’t they tell you about all of this on Grand Designs? Providing reflexology during this time restored me and gave me the calm I needed to keep going. Honestly, my clients helped me as much as I helped them. I love scandinavian interiors, mid century design and plants, and can't wait to get the house decorated and furnished properly. I pretty much eat a sugar-free diet, buy organic whenever I can, and would be a vegan if I didn’t like cheese, eggs and fish so much! I love music, I still go to gigs and festivals, and there's always music on in the house (much to my children's horror, I'm not of 'the new age' with my choices, apparently). The Charlatans are my favourite band and Tim Burgess is my hero (I met him once and he didn't disappoint). Can't wait to catch them at The Great Estate festival this summer. I have an unhealthy footwear obsession with trainers and clogs. I enjoy running (good for my mind and body) and have completed a couple of half marathons. Gardening is a passion and gives me my meditation time. I’ve recently become a member of a contemporary choir which is just lovely. I'm quite crafty (in fits and bursts) and make things on my mum’s 50 year old sewing machine. I’ve also just learnt how to macrame. I’m in my mid forties and sometimes get a shock when I look in the mirror these days. I still expect to see a 25 year old staring back at me. I’m not scared of ageing though, and believe that people with wrinkles and twinkles (in the eyes) have the very best faces!